Chennai Photowalk wanted to schedule and cover four important monuments in a photowalk during the Madras Week 2015 celebrations i.e, 1. Freemasons’ Hall, 14 Ethiraj Salai, Egmore, Chennai-600008; 2. 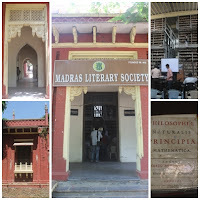 Madras Literary Society (MLS) library, DPI Complex,, College Road, Chennai, 600006; 3. ‘Doveton House’ (built in 1798), Women's Christian College, College Road, Nungambakkam, Chennai 600006; and 4. Regional Meteorological Centre, Chennai, Old No.50, New No. 6, College Road, Nungambakkam, ( Near Shastri Bhavan) Chennai - 600034. Obtaining permission was appearing as tedious process. To our surprise 'History and Heritage of the Cooum River' a power point presentation was arranged in MLS Library on 15th August 2015 between 3.00 and 04.30 pm by Cooum Cultural Mapping group, Chennai. Chennai Photowalk arranged Walk # 1, a photowalk in consultation with PSG to visit the 203 year old MLS Library on the same date between 2.00 and 3.00 pm. Mr.Venkatesh Ramakrishnan and Mr.T.R. Shashwath of Cooum Cultural Mapping group were already available in the premises. The young architect Ms.Thirupurasundari Sevvel, who loves to research into traditional architecture, is on a mission to preserve and revive the aura of the past. Since she is very keen in taking part in events that offer an opportunity to celebrate the city’s heritage, she made her presence in MLS along with volunteers of her Nam Veedu Nam Oor Nam Kadhai team. Ms.T Sundari also plays an active role in MLS Library maintenance, use promotion and conservation of Library collections. The Librarian displayed few prestigious rare monographs held in the collection. The architect was explaining the history of MLS, the library building designed and developed in accordance with Indo Saracenic architecture with Rajasthani style elements i.e, brick and lime mortar wall, Madras roof, Cuddapah slab flooring, high ceiling with interiors, tall windows with Jharokha balconies, designer jalli, ornate cornice molding along the top of an exterior wall etc. The British East India Company relocated its capital from Madras to Calcutta in 1772. The British East India Company encouraged their employees (i.e, military officers and civil servants) to form societies. William Jones founded the Asiatick Society of Bengal 1784, 'to encourage enquiry into the history, civil and natural, the antiquities, arts, sciences and the literature of Asia.' It immediately became the important learned society in the British colonies. The Asiatic Society of Bombay was also founded in Bombay in the same time to promote Asian studies based in Bombay. During this period the presidencies of Calcutta, Bombay and Madras were subject to the direct control of the London Office of the East India Company. The societies played vital role in the promotion of Asian studies and served as the limb of the British Indian government. The societies not only collected books, but also documented anthropological and geological data and collected palm leaf manuscripts. The 'Literary Society' refers to a society which desires to promote research in the chosen fields or subjects, publish newsletter and or learned periodicals and hold seminars, symposium and meetings wherein research findings can be discussed after presentation. The Literary Society of Bombay was founded 1804. 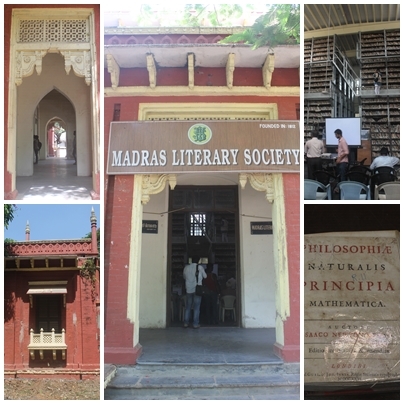 The Madras Literary Society was founded in 1812. The Literary Society Libraries forming part of these Literary Societies served as the 'Clearinghouses', wherein the Societies identified, collected, collated and made access to data and information on 'literature, exploratory and scientific discoveries, experiences of the Civil, Military and Judicial officers of the respective presidencies. Francis Whyte Ellis (1777–1819), a British civil servant was inducted in the Indian Civil Services (at the time a division of the British East India Company) in the Madras Presidency and soon elevated to the position of Collector of Madras in 1810. 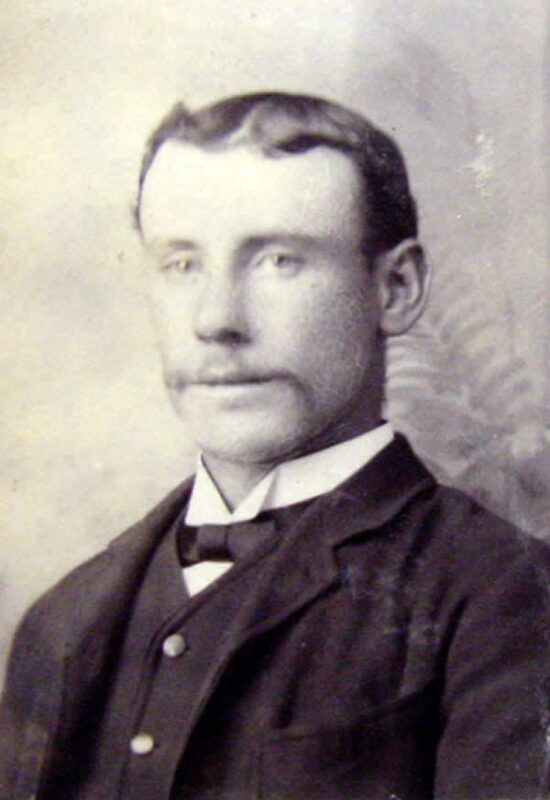 He was also a member of the Member of the Madras Literary Society. He planned and founded "the College of Fort St. George" "a major Knowledge Centre" at Madras in 1812. The purpose of establishing the College of Fort St. George was to train East India Company officials in native languages. Ellis was an erudite scholar and he developed good relations with best Indian scholars like Pattabiram Shasthri, Muthusami Pillai, Udayagiri Venkatanarayanayya, Chidambara Vaathiyaar and Syed Abdul Khadar. Ellis influenced them to train the Indian students in grammar and law. The trained Indian students were employed in College of St. George as instructors to teach the civil service recruits arriving from England. The newly recruited civil servants of the Madras Presidency spent their first two years learning one of the South Indian languages. The College of Fort St. George was functioning in the campus wherein Directorate of Public Instruction (DPI) now functions in College Road. Of course the name College Road was to indicate the College of Fort St. George as its landmark. The college functioned here till 1854. Madras Literary Society and Library complemented the 'College of Fort St.George,' 'the School of Language and Oriental Studies' in the training of the newly recruited Civil Servants of the Madras presidency. The Royal Asiatic Society of Great Britain and Ireland, commonly known as the Royal Asiatic Society (RAS) was established in London in 1824 by a group of notable scholars and colonial administrators. It was intended to be the British counterpart to the Asiatic Society of Calcutta, which had been founded in 1784, by the noted Sanskrit scholar and jurist Sir William Jones. According to a charter received from King George IV, the Royal Asiatic Society was affiliated to associate societies in India (Calcutta, Bombay, Bangalore, Madras, and Bihar). In 1830 the Madras Literary Society became an Auxiliary of the Royal Asiatic Society of Great Britain and Ireland and has generally been known as the Madras Literary Society and Auxiliary of the Royal Asiatic Society. Libraries controlled by different bodies which were in need of space were invited to occupy some portion of the Connemara Public Library. 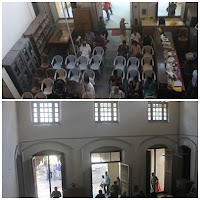 The Madras Literary Society Library was the first to function inside the Connemara Library until it was shifted in 1905 AD to its present building on College Road. The Madras University Library occupied the space vacated by the Madras Literary Society Library and functioned there until 1928 AD when it moved to the University Buildings at Chepauk. 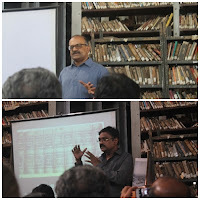 The Oriental Manuscripts Library which was also housed in the Connemara Public Library till 1935 AD, moved into the University Buildings at Chepauk. The single - storey library building is a red-brick structure with intricate sandstone trimmings inspired by the Rajasthani style of architecture. The walls and columns were built with brick and lime mortar. The high Madras Terrace roof is still strong. The flooring looks even and smooth. It was built for library purposes with an enormous hall and high ceiling for natural light. It appears like a two storey building from outside. Library Furniture: Rosewood tables and chairs used in the reading hall . The Expenditure for maintaining the library is met by the Madras Literary Society. Madras Literary Society Library serves the public daily from 10.00 am. to 05.00 pm. on weekdays. The library is closed on Sundays, three National holidays and selected festival holidays a year. The stock of volumes stood at 83,000. This well stocked library has valuable reference and research material: Old East India Company records, learned periodicals of the Asiatic Society, old and rare books of Tamil grammar, and even old issues of Punch magazine published in 1870. The library collection also includes fictions, philosophy, literature, history, linguistics and other subjects. The books are soiled and due to age and some books brittle. The library has received good number of books by way of donations from individuals, institutions and Governments. Apart from this MLS library also builds collection by purchasing from the funds made available by the MLS. Some of the rare books in the collection include books like Arretolis Opera Omania QVAE Extant Graece and Latine, published in 1619 (the earliest book available in the library). Philosophie Naturalis Principia Mathematica (Issac Newton's Masterpiece Pricipia Mathematica in Latin) and Robert Boyles works Vol. III (1772) are some of the rare books in the Science collection. Stack Room: No distinct stack room earmarked for the library. 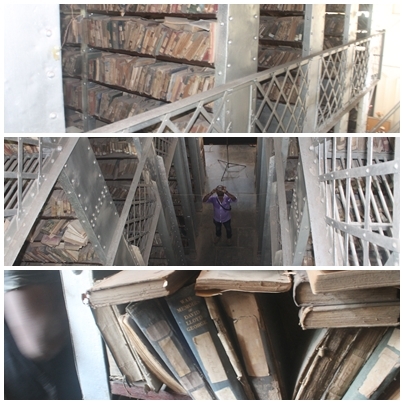 Books are stacked in multi-storey wrought steel book racks supported by ladder type staircase. Books are arranged in open access system. However some are classified or restricted and available for reference only. Books are classified according to Dewey Decimal Classification System (version not known). Card catalog system is not found within library premises. Searching the books could be according to the classification sequence. Any person is eligible to use MLS library service. Membership is open to common public. Every member can borrow maximum of six books at a time for a period of two weeks. An annual admission fee of Rs.850+50- per member is collected every financial year. At present this Library has 200 members on roll. The distinguished members in the past include Annie Beasant, Subhas Bose Dr. S. Radhakrishnan, TT Krishnamachari and CP Ramaswami Iyer. Library delivers Books on loan to elderly at their home at a nominal charge of Rs.20 per set. The reading area is located at the entrance. Around 20 seats are made available for users to sit and consult the books. The Society published a learned periodical called the Transactions of the Literary Society of Madras from 1827 and continued from 1833 under the name of Madras Journal of Literature and Science and was published up to 1894. Till 1858 the periodical was edited by the committee of the Madras Literary Society and Auxiliary of the Royal Asiatic Society. The volumes published during 1880 was edited by Gustav Oppert, Ph. D. (Professor of Sanskrit, Presidency College, Madras; Telugu Translator to Government; Curator Government Oriental Manuscripts Library; Fellow of the Madras University). Survivors of time: Pages from the past. Asha Sridhar. The Hindu 4th October 2011.